The new western ticket hall at Kings Cross opened to little fanfare on Sunday. Why should you care? Well, it brings to an end months of hellish interchange at the station, during which the ever-shifting layout of temporary corridors left us feeling trapped in a Stalinist Hogwarts. And it’s also goodbye to the matching Soviet-style ticket queues at the prefab hut outside. The new hall is a utilitarian white & blue oblong of limited glamour (though they’ve stuck some ‘platform for art’ in the corner to brighten things up). It looks something like an empty swimming pool, as if taunting the nearby river Fleet to burst its subterranean banks. Indeed, walking through this clean, spacious area, it felt like Kings Cross had finally received the colonic irrigation it so desperately needed. It will now be able to handle twice the number of passengers, which will be handy when the Eurostar and new Thameslink stations come on-line. Not to mention the Olympics. There’s also step-free access to the Circle, Met and Hammersmith lines. 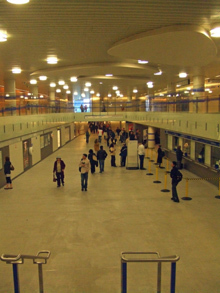 A second new ticket hall will open to the north in 2010 to further help things along. In other transport news, the network’s 100th night-bus route opens on Sunday (that’s up from 57 routes in 2000). The 281 will operate a 24-hour service between Hounslow and Tolworth. At the same time, as Diamond Geezer notes in improbable detail, the last bus with a letter A at the end of its number has now been rechristened. It’s a transport revolution.